A glass sink is a great addition to any modern bathroom vanity. Whether you choose a vessel sink that sits on top of the vanity surface or choose one that is sunken into the surface, these sinks add a unique style to your space. 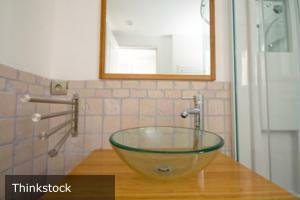 There are many different styles of glass sinks available, ranging from clear to brightly colored and patterned glass. Textured, frosted and smooth surfaces are also common. No matter what color or type of glass sink you choose, experts say that a little bit of extra care and maintenance will keep it looking its best. According to NouveauBathrooms.com, these sinks should be cleaned with a soft cloth, such as a cotton rag, to avoid scratching the surface. Dampened newspaper can also be used to help avoid streaking. The website also suggests avoiding cleaners with acids and bleaching agents, as they can diminish the surface's shine. In addition, it's important to dry these sinks after using them to avoid hard water residue and build-up. Simply keep a sponge handy to wipe off the remaining water.